It’s a complaint often heard in Flanders: No one in Brussels speaks Dutch. It’s not only seen by the Flemish as disrespectful, it can be a factor in deciding whether they want to live in their own capital city. But things in Brussels are changing, according to the Brussels chapter of Huis van het Nederlands, which assists people in learning the language. Last week it hosted the Model NL Summit, the final event in three months of discussions and debates on the state of Dutch in the capital. 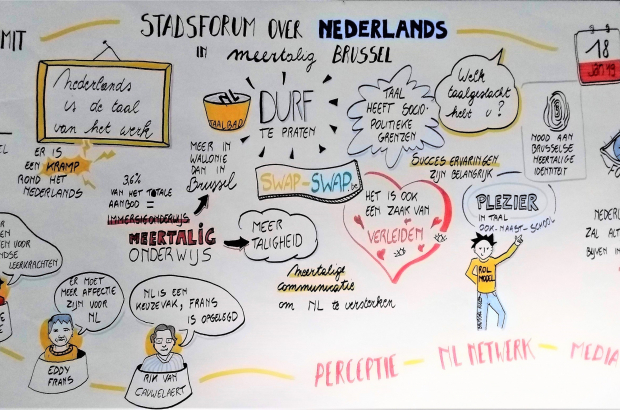 Model NL took in the opinions of language teachers, politicians, companies, organisations that use or otherwise promote Dutch and Brussels residents to gauge their attitudes towards and use of the language. One of the interesting facts that emerged is that, while fewer people speak Dutch fluently, more people are speaking it at all. And, being one of the country’s official languages, signage in the capital is routinely in Dutch as well as French. This makes it easier – unavoidable really – to recognise the language and see it as an integral part of Brussels. That wasn’t always the case, Van Neste points out. Several speakers at the Summit discussed how they tackled the Dutch issue within their own organisations. Some of them are specifically about promoting or teaching Dutch, while others used the language as a matter of course – but ran into issues. That was the case for Becode, a free coding course launched in Brussels in 2017. While the incredibly successful programme was offered in both French and Dutch, no one wanted to sign up for the Dutch-language course. It also had trouble finding someone to do the marketing and communications who was fluent in both languages. But the organisation was persistent, said speaker Ayoub Mohyi, and is now finding more students who are keen to enrol in the Dutch-language section, whether they speak Dutch as a first language or not. The message was clear: Becode didn’t give up when Dutch as first did not succeed. Mohyi also gave a personal example to illustrate the evolution of Dutch in Brussels. He grew up in a home where no Dutch was spoken, he said. But he learned it in school, and now his own child, 10 months old, has a vocabulary of four words: the Dutch and French words for mum and dad. His message was clear: While newcomers might not speak Dutch, the same will not be true of their children and grandchildren. Silke Quateau, meanwhile, described a typical class in Taalkot, a Huis van het Nederlands programme that turns Dutch learning into an interactive experience more than a lesson. The programme is open to 15- to 25-year-olds who speak little or no Dutch. Taalkot is offered to these young people only if they are enrolled in part-time education, in co-operation with their schools. It mostly attracts people with foreign origins, who need to improve their chances on the job market. But the biggest applause of the Summit’s seminar went to Khadija Chentouf, who moved from Morocco to Brussels 27 years ago. A federal parliament worker, she speaks French, English and Arabic. She started a Dutch class last month, much to the amazement of her friends and family. All of the examples point to efforts to de-polarise and de-politicise the language in the capital. This is crucial for the language’s image, according to many of the speakers. Gunther Van Neste (Flemish surname): “Brussels has always been considered a mainly French-speaking city." Brussels was a Flemish city from the very beginning till ± the middle of the 18th century, when francophones and francofiles started ruling the roost. The history of Brussels goes back to the Neolithic Period. IN (what is now) Flanders. It's ridiculous (and blatantly untrue) to claim that Brussels has ALWAYS been considered a francophone city.